Shopping for Ultraman Action Figures? 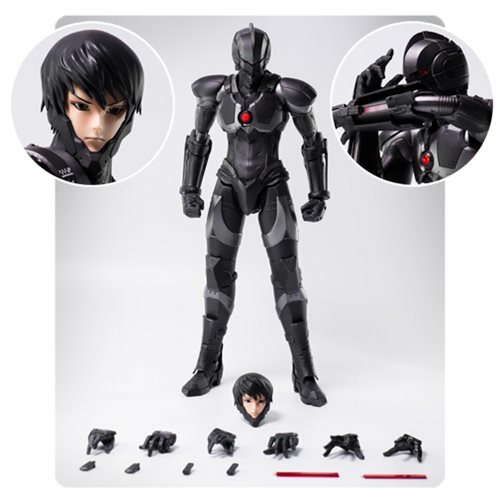 From the Ultraman manga written by Eiichi Shimizu and Tomohiro Shimoguchi comes this Ultraman in Stealth Suit version 1:6 scale action figure. The Ultraman Stealth Suit Version 1:6 Scale Action Figure measures approximately 12-inches tall with about over 40 points of articulation. Eyes, Color Timer on the chest, and the Spacium Ray device on the arms all have an LED light-up function. In addition to the helmet head, it includes an interchangeable bare-face head of Shinjiro, which was sculpted by a Japanese figure artist Ryu Oyama. The figure also comes with 4x sets of interchangeable hands (relaxed hands, opened hands, fists, and Spacium Ray shooting pose hands) and effect parts for Spacium Blade. The figure requires 8x "AG-1" button cell batteries (not included).